In Sheffield, Mass., just a few minutes from the northwest Connecticut border, there is a brewery. 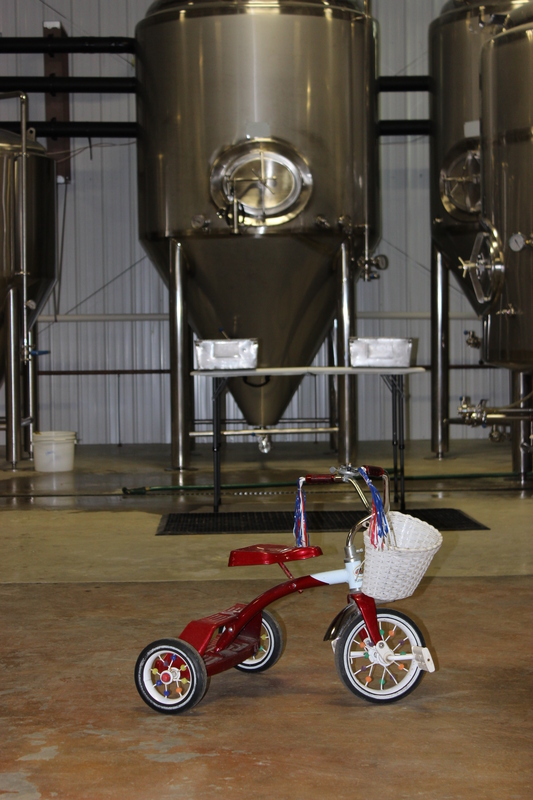 And in that brewery is a tricycle. And a sandbox shaped like a tugboat. For owners Christine and Bill Heaton, Big Elm Brewing is more than just the culmination of two careers. It’s where their two children are concocting their first memories. Big Elm Brewing opened in October and is one of those family-owned businesses you want to succeed, if only for the sincere and hardworking crew keeping it afloat. I met the Heatons in early December, when I stopped by for one of Big Elm’s Saturday afternoon open-houses at their site: a large hunk of a building in a quiet, rural industrial park. While she settled the kids down for a while, I bellied up to a small wooden bar the Heaton’s had erected for tastings. To my left were windows that allowed me to peer into the brewery itself. Shiny new tanks and barrels made a dent in the outsized space. The tricycle and sandbox gave it the appearance that taking the kids to work day was every day. Christine, a round-faced, dark haired Pennsylvania native, came back and was joined by her husband, who sported the mandatory brewer beard. I wanted to get in a little background on the brewers before sampling my way through six taps’ worth of microbrew. Like any good love story, the Heatons’ begins with shared interests. In their case, it was beer. Christine, 37, had been homebrewing while an undergraduate chemistry major in Millersville University. After she graduated, Christine served in the Peace Corps for three years, helping local citizens improve their agriculture. Upon returning, despite pressure to do almost anything else, Christine decided to pursue a professional brewing career. As much as she was impressed with Victory’s consistency, following house recipes got a little stale by 2005. Christine moved on to study brewing at the Siebel Institute’s Doemens Academy in Munich, Germany. There, she used her chemistry background to her advantage and continued her love affair with pilsner, a quintessentially German style. It was with Bill, 42, that Christine hatched the dream of running a microbrewery — one in which she could blossom and put her talents to the test. Bill is a fine arts major who, after a stint in the advertising business taking product photos, also turned to the beer trade. Although he was a brewer, Bill rose within the Victory ranks as manager of the packaging line. He ended up in 1996 cleaning kegs at a Chambersburg, Penn. brewery before settling in with Victory. Wanting a fresh start in a new region, the Heatons decided in 2005 to run Pittsfield Brew Works, a brew pub that they took over in Pittsfield, Mass. By their own admission, the Heatons said that the business became unwieldy. Ultimately, soon after Tobi was born, it was time to take the plunge as a small, independent brewer. The name comes from Sheffield history. The oldest community in the Berkshires, tiny Sheffield has deep agricultural roots and its symbol is The Big Elm. This elm grew for over 400 years at the corner of Route 7 and Silver Street – just yards from the brewery. It had to be cut down in 1926, but lives on in the town seal and Big Elm Brewing’s logo. “We have everything we have ever worked for invested in this company,” Bill said. That’s no small gamble. To ensure the brewery’s stability, the Heatons launched its Big Elm IPA with a tweaked recipe based on its Legacy IPA from the brew pub. I found the Big Elm IPA to be explosively fragrant and complex, and while bitter at first, mellowed out after each sip. Their 413 Farmhouse Ale, a saison, is a marvel. Light and fragrant, it’s made with local hops and pink peppercorn from Brazil, Bill said. It was one of the stars at a recent beer dinner at nearby Route 7 Grill in Great Barrington. It was paired with a hearty kale salad. Big Elm partnered with the Route 7 Grill chef, who smoked malt to create a “rauchbier” (smoke beer) and paired that with a butternut squash soup. The brewery — which also offers a blond ale, a stout and a stout aged in oak bourbon barrels — doesn’t worry about hitting style specifications exactly. “We make it the way we like it,” he said. 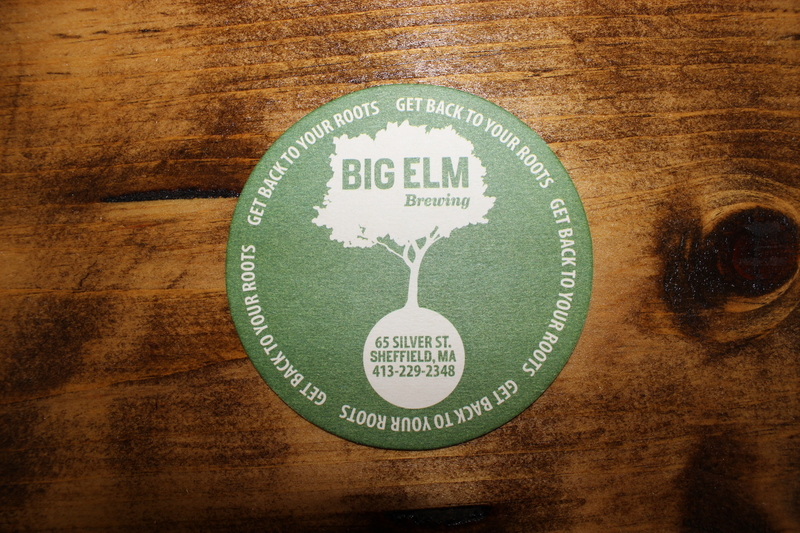 Lester Blumenthal, the owner of Route 7 Grill as well as a bartender, said that Big Elm Brewing is a pleasant addition to the area and a big seller at his restaurant. The kids were up and about when it was time to leave. As we passed the various pieces of kiddie equipment in the brewery, the Heatons were all smiles with their children by their side. This entry was posted in Beer Snob and tagged Big Elm Brewing, Route 7 Grill, Sheffield. Bookmark the permalink. I have just tasted the IPA and I love it …. There are hop heads out there that want an IPA to taste so piney that no one else would have it …. but this is a smooth and drinkable brew for all beer drinkers to enjoy.